Wolverhampton is currently going through quite a lot of rejuvenation, and although there are a fair bit of development works on-going there are also some new shops opening already. 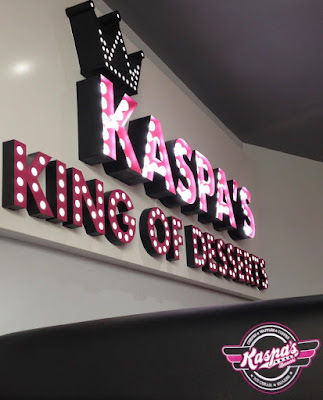 One of the new shops is a new dessert and ice cream bar, Kaspas. 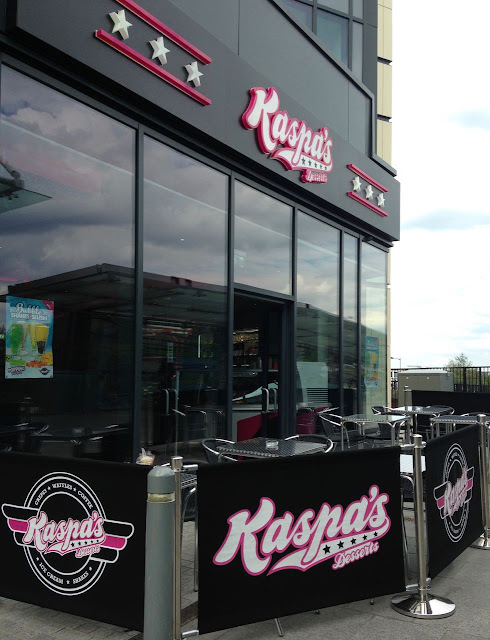 It bright pink and shiny exterior brought me in, as did the promise of a huge selection of ice creams! The place is very smart inside, with booths to sit in. Think 1960s diner meets a modern touch of glitter and sparkle. I loved the look of the place and we were welcomed to our table and given menus. I found the menu quite overwhelming, all sorts of sundaes, waffles and pancakes with a huge selection of toppings. I was here for the ice cream though and chose a two scoop bowl of strawberry cheese cake flavour and dolce latte ice cream. The drinks menu was also a difficult choice, from slushies, milkshakes through to hot drinks. To give you some idea, I went for a Mojito flavour Bubble Tea Slushie with Lemon and Lime balls (bubbles)! When the items arrived they looked fab. I don't normally go for slushies (I'm afraid of the ice cream headaches) but as the weather has been so hot, I thought it safe to make an exception. The drink was very refreshing, the mojito flavour was quite light but had a nice minty lemon taste, no alcohol of course, this is an ice cream bar. I also had an extra wide straw, necessary for the bubble element of the drink. The balls are quite a bright green colour and do travel up the straw easily. Once in the mouth they burst pleasingly delivering a lovely refreshing citrus pop to the taste buds. It's a fun drink and so very refreshing on a hot muggy day. The ice cream was spot on too. The Dolce Latte was essentially a sugary caramel flavour. It was quite a rich dark taste, but balanced by the creamy content which gave it a smooth finish. The strawberry cheese cake variety was a more fun ice cream with a creamy hint of vanilla and juicy strawberry bits too. There were some lovely soft biscuity flavours and textures to replicate the cheesecake base. These worked well, and were fun to find in the ice cream. 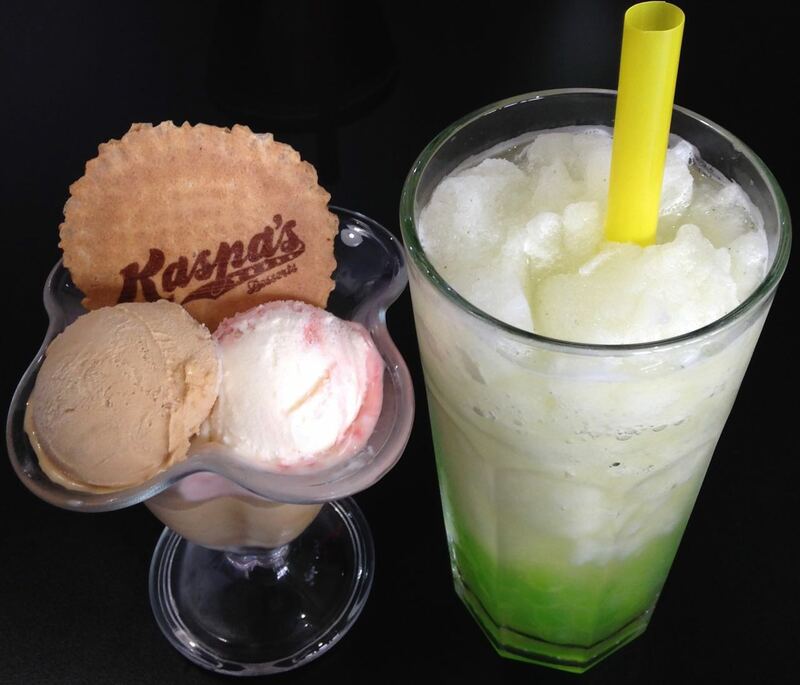 Both ice creams were well flavoured and creamy, and I look forward to trying out more from their huge selection. I can see this shop being very successful in Wolverhampton. The choice of goodies is quite mind blowing, everything you could ever need for a sweet tooth. I’m really looking forward going back and trying the waffles and pancakes. This chain is opening in Nottingham and Derby soon!